News Forum: Would you subscribe to a citywide service? Should more cities provide WiFi coverage? If you spend a lot of time on the Internet you may have already gone wireless. Many coffee shops, hotels and other businesses offer WiFi services to customers, and the next wave of the WiFi revolution involves whole cities going wireless. The city of Minneapolis is one of several Minnesota cities that wants to provide wireless Internet access to everyone. Supporters say the initiative will make Minneapolis one of the largest cities in the nation to go Wi-Fi. But critics say the city may headed down the wrong track by making some decisions without enough public involvement. Minneapolis, Minn. — Minneapolis officials want the city to be like Chaska, a southwest suburb. Residents of that fast-growing city can access the Internet from anywhere in Chaska's 15-square-mile radius. Minneapolis is much bigger in population and geography, but city officials think they can build a system that makes wireless Internet service available everywhere. 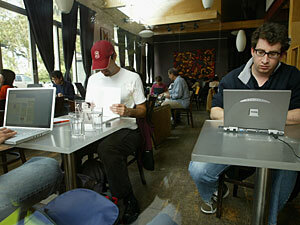 The system will be set up much like WiFi services at coffee shops throughout Minneapolis. But instead of creating a mini hot spot that reaches just 300 square feet, equipment will be set up on telephone poles and buildings and the signal will be citywide. Catherine Settani, who is working with the city on the wireless system, wants everyone in Minneapolis to have access to Internet services at an affordable price. "The beauty of a cloud, a municipal system where the entire city is covered is that as you move from house to car or house to LRT or bus to business to lunch, you have the signal with you the entire time," she says. Settani says the goal is to provide WiFi Internet access to residents for about $20 a month. But she says the project is primarily meant to improve city services. For example, police officers looking for a suspect in downtown Minneapolis could instantly download security video. Firefighters could download building plans on their way to a fire and city inspectors could type up reports on the scene of an inspection. The city is negotiating with two private companies to set up the wireless system. Residents, businesses and visitors would pay those companies to use it when its up and running in 2007. Bill Beck, deputy chief information officer for the city of Minneapolis, says no taxpayer money will be used to create the network. He says city officials thought about owning and operating the network themselves but decided against it because they concluded private businesses could do it better. "The city today cannot afford the $25 to $30 million capital investment just to build out the infrastructure," Beck said. "The city also does not have the core competency to own, manage and deliver these services." But some say the city is taking a risk by contracting out to a private company instead of setting up the network on its own. Becca Vargo Daggett works for the Institute for Local Self Reliance, a nonprofit group. She wants the city to build the network with city money and then hire an Internet service provider to manage it. Vargo Daggett says Minneapolis is taking a risk by entering into an untested business model with a private company. She says cities like Chaska and Corpus Christi, Texas have public ownership, which gives them control over how the system is operated and ensures its quality. Vargo Daggett is disappointed that Minneapolis staffers made key decisions without hearing from city residents. "The decision that the network would be privately owned was made before the project was even announced to the public," Vargo Daggett said. "There has been no public process, there have been no public hearing. There have been no public hearings meetings. This a huge infrastructure project and the public has not been included at all." While Vargo Daggett wants public ownership, Minnesota Qwest President John Stanoch wants the city out of the wireless business altogether. Stanoch says Minneapolis residents already have high speed Internet access from Qwest and other companies. Qwest bid on the wireless system along with eight other companies but was not chosen as a finalist. Stanoch says he thinks the city was never interested in having Qwest provide the service. "Our attempts to learn more information about the process were met in many cases with that information will not be made available to you," Stanoch said. "I think there's been a clear bias against existing providers shown by the city staff and we have not been treated, in my view, fairly in this process." Bill Beck, with the city of Minneapolis, says one of the reasons city officials haven't been forthcoming with their proposal is because they have concerns about lawsuits and regulatory restrictions. Several states have already restricted cities from directly competing with companies that offer high-speed Internet access. The two companies that have been selected as finalists --Atlanta-based Earthlink and Minnetonka-based U.S. Internet -- will set up pilot projects this month. The City Council will hear more about the proposals in January.